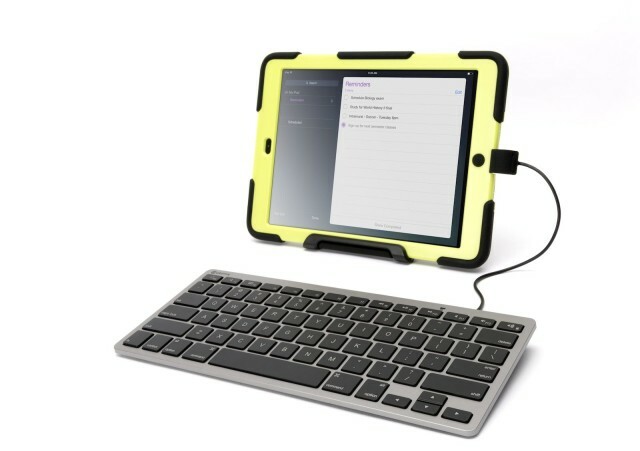 Griffin’s Wired Keyboard for iOS Devices is equipped with a one-meter cable, ending in either a 30-pin or Lightning connector, that connects directly with an iOS device. There’s no internal battery to recharge, since power is supplied directly from the iOS device itself through the connection. The Nashville-based company says it designed the keyboard “specifically with school environments in mind,” which makes perfect sense. Rather than have 30 students wailing about how their iPad’s keyboard won’t turn on — or that Billy has somehow paired his keyboard with Craig’s now hijacked iPad, and is currently sending unpleasant emails to the school’s principal on behalf of Craig — the wired keyboard would be as simple as plugging in. Busy executives (or journalists) could also use it on flights even with their iPads set to Airplane Mode. The wired keyboard’s popularity outside these scenarios will probably be somewhat limited. At $60, it’s somewhat expensive for a wired keyboard; and untethered typing is just so, well, liberating.